Today I learned of another mom and another dad who have had to say goodbye to their child. Their new baby. A baby they loved, a baby they named, a baby they held, a baby they looked forward to getting to know, and watching him grow. I have been praying for him and his parents for the past several days. Praying for a miracle. Praying that they would not have to know the pain of burying their child. These are people I care about. The thought of them going through this broke my heart. So I, and thousands of others, have been praying with all our hearts. So, when I heard that their little one breathed his last breath I felt the bitter disappointment of knowing our prayers for a miracle were not answered in the way that we had hoped. I feel so very sad. So angry. So hurt for them. The death of your child brings, along with intense pain, so many questions. Nothing makes sense. Your mind reels with the nonsense of it. How can you be burying your child? That is not the way it is supposed to happen. There is a certain order to this world and that is not, in any way, a part of it. The questions keep coming until you will do anything to make it stop. I have been wrestling with these questions for five years now. 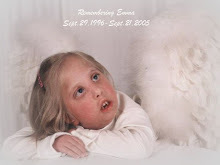 Five years since I watched the casket holding my precious little girl close one last time. I think I have found some of the answers. But it took time and searching. I still have more though. Today, as I grieve for the parents of this beautiful baby boy, all of the answers I have found seem meaningless. We could shower them with our words of hope and comfort, and when they are ready they will find some of the same answers to their questions. But, right now, there are no words. No words to take the pain away. The pain is deep and raw. It hurts. It makes you feel sick, weak, hopeless. I am shocked at the intensity of my own emotions as I feel for them. I am sitting here just heart broken. I want to take it away. I don't want anyone to ever go through this. I feel sad and angry for them. In this past year I have felt for the first time that the pain I have suffered will serve a purpose in this world. I don't, in any way, believe that the things we have gone through were for this purpose. I believe that God can redeem the plans of the one who steals our joy, the one who causes our pain in this world. I believe that God can bring purpose from our pain. For me, that is coming in a new passion for those who have lost a child. I feel it in the deepest parts of my heart. A longing to do something to bring at least a little comfort and peace to these moms and dads. To help them as they find their own answers to their own questions. Finding a passion can be a liberating thing. To feel purpose for your life brings joy and energy and peace. But it is bittersweet when the thing you feel that passion for is because there are broken and hurting people in this world. But, the reality is, as long as we are here there will be hurting moms and dads. My prayer is that through Emma's Gift Ministries there will be healing, hope, and restored purpose for many families. Yes, my heart is breaking, but I thank God for a heart that breaks for a purpose. For His purpose. Brought forth from my pain. A new year is just about here. I ask you, as you make your resolutions and goals, to consider asking God to break your heart this year. Ask Him to show you how to use your pain for His glory. Ask Him to show you the purpose in your life. Not just to be a good person and pay the bills, but to find a passion that comes from a heart that is broken for someone else. If you do, I promise this new year will be one of the most meaningful times of your life. I don't mean to say it will be easy in any way. But it will be rewarding. Eternally rewarding. Well expressed. I have been in "the process" for thirty years now. Still waiting for some other outcome. Perhaps 2011 with be more enlightening.